With its comfortable and warm flickering, a fireplace can be a very appealing centerpiece for any home. 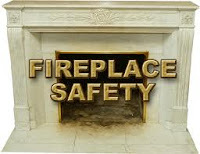 Learning about fireplace safety can help you to enjoy your fireplace without worry. Whether you already have a fireplace or you are considering adding one to your home, here are some ways to keep safe around the fire. 1. Keep a fire extinguisher and know how to use it, just in case you ever need it. 2. Have your chimney inspected and cleaned every year by a chimney specialist. When fireplace cleaning and maintenance are neglected, it can allow an excess of creosote to build up unnoticed inside the chimney, which can lead to a house fire. No matter what type of fuel you use, always have your chimney inspected by a professional, because regular maintenance is needed to keep your fireplace both safe and efficient. 3. When you build a fire, enjoy it and don’t leave it unattended. If you‘re around to keep watch, you’ll be able to stop a spark from turning into a inferno. 4. Don’t leave any trash, decorations, or flammable objects within two feet of your fireplace. Your hearth should be clean and clear. 5. Consider a mesh screen/curtain on your fireplace, it will keep the embers safely inside. 6. If your fireplace has glass doors, leave them open while the fire is burning so that the fire can get the air it needs for combustion, because this will help to prevent excess creosote buildup. When the fire is out, close the glass doors to prevent air from coming in the room from the chimney. 7. Always use fire-resistant materials around the fireplace. 8. Make sure that your smoke alarms all work. 9. Keep small children and pets a safe distance away from the fire to prevent accidents and burns. 10. Burn seasoned hardwood rather than moist or soft woods to lessen creosote buildup. And most important of all, remember to use common sense. This way, the next time your family and friends gather around the fire, you can be sure that everyone will have a good time and be safe too. Article is provided by safety expert, Jennifer. Jennifer likes to write about keeping children safe inside the house and in the backyard. With summer approaching, please don’t forget to install a pool safety fence around your pool. Along with automatic pool covers, it can save lives.